I had walked past Chotto Matte on Frith Street several times but had never been and so when Amit and I were looking for a restaurant for date night, we decided to check it out. It had a lovely buzz as we walked in, with a gorgeous bar area downstairs. Our table was upstairs in a large spacious room, and we got a lovely corner table, perfect for people watching from. The restaurant is owned by Kurt Zdesar and is one of the few London restaurants serving Peruvian-Nikkei cuisine, which is a fusion that resulted from the Japanese diaspora living in Peru. This intrigued me and so I was excited to try the food. It is very much a sharing concept and so I was pleased to be able to try a variety of dishes. For drinks we ordered cocktails, a Mojito for me of course, and an Old Fashioned for Amit. The only thing was that our cocktails arrived after our first course, so I felt like the service could have been a little slicker in this respect. For the rest of the evening the service was absolutely on point with the dishes arriving at a reasonable speed, and our server was really lovely. For our first course we chose 2 different Tostadita Morada’s, which are Peruvian purple corn tostidas with different toppings. We had the Tomato ceviche served with huacatay sauce and crushed cancha, and the ‘Classic,’ which was tuna sashimi, corn crisp, jalapeño, coriander and wasabi. I am not usually a Tuna fan and this was Amit’s choice but I did try a little and it was really good even for someone that doesn’t enjoy Tuna normally! The Tomato Ceviche was a joint favourite and it was so fresh! 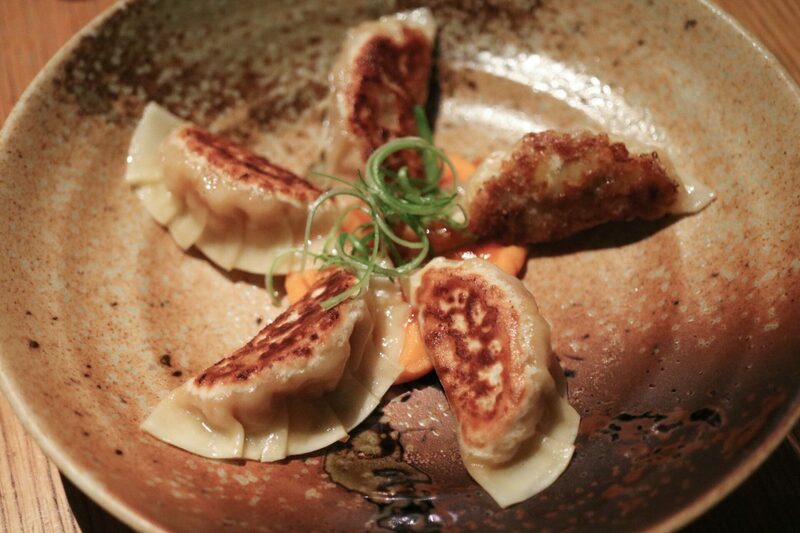 Next up was 5 pieces of Nikkei gyoza, which were pork, prawn and cassava dumplings served on aji amarillo and with a helping of sweet potato purée, which was moreish. Amit did ask for some Siracha sauce on the side and the gyoza with the Siracha tasted divine. Maíz, aguacate y papa morada ahumada kakiage, which are fritters made from corn, green bean, avocado and spring onion, and served with a daikon sauce were so addictive and a great choice for vegetarians too! The dish that didn’t move me was the Nikkei sepia, which was calamari with an aji amarillo emulsion. It was perfectly cooked and tasted lovely but it didn’t strike me as having any extraordinary flavours. The Pollo nipón, which was chicken yuzu teriyaki, however, was a really flavoursome and incredible dish and I would go back for this dish! It was a really generous portion and just tasted so incredible with such lovely varied flavours. I would really recommend this dish if you are dining at Chotto Matte soon. Finishing with one of my favourite desserts, and recommended by the server, we had a Brulee de la passion served with an almond financier, aji amarilo and zesty guava sorbet. It was absolutely divine and the perfect sweet ending to a wonderful date night meal. I really enjoyed the food at Chotto Matte, and aside from the delay in our cocktails, the overall experience of the fusion of Peruvian and Japanese cuisine, the various different flavours, ingredients and textures, and the service was fabulous. The restaurant had a lovely buzz and it was a great venue for date night. I would love to go back and experience the brunch too! It was on the pricier side and our bill came to just over £100, but the food was really enjoyable, fresh and high quality and really different and we has a fantastic date night. If you love different cuisines, and do love Japanese or Peruvian flavours, or trying something new, it is definitely one to add to the list! I’d go back for that sweet potato purée alone… in fact it’s been too long without it in my life. I love sharing food! Love the look of all the dishes you had!